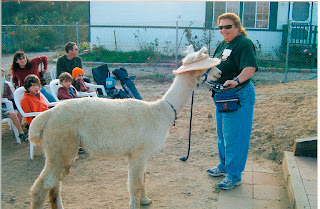 In my last blog, I wrote about teaching the alpacas to take turns. I typically clicker train my alpacas two at a time and sometimes even more. This goes against the conventional wisdom of clicker training. I clicker train my dogs one at a time. However, I have found that working with an alpaca alone doesn't work very well. They are herd animals and are not happy being away from their herdmates. When I start working with an alpaca for the first time, I have had very little success working with that individual alpaca alone. They are too skittish and all they want is to get back to their herd. But, if I have one or more in with them, I have more success. I will often pick an alpaca that is not as food motivated if I'm working with a new alpaca or one that is very shy and reticent about taking food from my hand. Selecting the buddy alpaca I want in with the one that I am focusing on depends on what I'm trying to train. Sometimes I choose an experienced clicker trained alpaca because they do learn from each other and the more experienced alpaca can show the novice how it works and they may feel more brave and curious if they see the one working with me. I also like to work with more than one because one of the most important behaviors I teach my alpacas is simply proper and appropriate behavior while being fed their goodies. I get a lot of farm visitors and the last thing I want them to experience is spit flying at them. That does happen and we all have to deal with it but I want to minimize it if I can, so training the alpacas to take their food nicely and in a group is important. 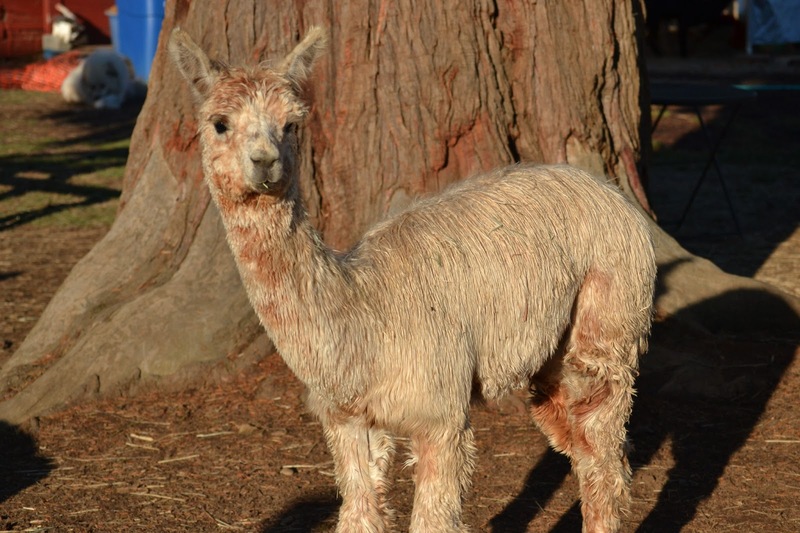 For those experienced clicker trainers who read my last blog and may have questioned my wisdom in clicker training in a group, I do so because of experience in being successful getting a new alpaca to learn clicker training and I do it because their being fed in a group is part of our training. There are some nifty clickers out there that make different noises to use with multiple animals so each has its own click. I haven't tried them with the alpacas but it could be a fun experiment. But for now, the system I'm using seems to work fine. How does the alpacas know which one is being clicked and why aren't they confused? From what I have observed, the alpacas learn which one I'm working with because of my body language. I turn away from the ones I am not working with. Body language gets a little tricky because I don't want to fully face the alpaca I do want to work with because that can be "heard" as a challenge or be seen as an act of aggression and I don't want to project that impression. But just a slight angle is all that is needed to prevent that more aggressive stance. It can get a little crazy at times I have to admit. When I play the halter game, I am holding up the halter and having animals wanting to stick their noses in and sometimes two or more will be trying to stick their noses in at the same time. But, with practice, I have gotten pretty quick about holding the halter in front of the one I want to put their nose in and click and move to the next one. I use the one's name that I want to put their nose in the halter and I go from one to the next. I am usually surrounded so I can get a bit dizzy! But it is a fun game and they learn so quickly and I have not experienced them being confused by me clicking one and then the next. They seem to get it. One thing about farm life, is that nothing happens like in a perfect world so clicker training the alpacas is a bit like the rest of farming with figuring out how to make it work with the tools and resources at hand! Once the alpacas get more comfortable with me and the clicker training, I can then separate and work with one alone. But even then, sometimes they don't like being in the catch pen with me alone. When I try to get one alone, it is because I am trying to work on a more advanced behavior and need to have their sole attention and being very tuned into their movements to get the click just right. I can do that with Mowgli and a couple of others but most, even after being trained and doing well with the clicker, still don't like to be in the catch area alone with me. I have found clicker training alpacas is a lot of trial and error, doing what works best for each individual alpaca and not being afraid to try new ways of doing things. When I first started working with alpacas, it was probably a very good thing that I didn't know how they were supposed to behave or what was natural to them. I didn't know any better so I didn't have any preconceived notion of behaviors not being possible and I was willing to try things that went against belief systems on what alpacas will or won't do. When I trained the alpacas to do things like stick their noses in halters on command and follow me without halters and lead rope and have them running to me instead of away from me, experienced alpaca breeders were blown away. The running joke was "Alpacas don't do that!" My book coming out this summer is titled that and I'm excited to share my experiences of clicker training and performing energy work on alpacas and other animals I have met. In my last blog, I wrote about the steps needed to train an alpaca to touch your hand with their nose. Once they have this behavior down, I use the hand touch to lure the alpaca into learning other new behaviors like taking a bow. I have been training Mowgli and Olivier to take bows in unison. The idea happened rather accidentally. Some behaviors, I wind up teaching the alpaca come from the alpacas themselves who spontaneously perform a behavior that I think is cool and then I work on repeating it. For the unison dual bow, Mowgli and Olivier both bent down together to take their bows and I was able to click them simultaneously and then they both ate out of my hand together. I thought that was cute that they both bowed together and I loved that they both politely ate from my hand together. With little effort, I was getting them to repeat the behavior. The one thing I had to figure out was to get them both to start with their heads looking up so they would both follow my hand that was luring them downward and hope that they'd do it together. I did the behavior a few times that first time and then walked away. I saw that I needed to figure out a few things as the trainer to get them learn the behavior correctly so it was better that I stop and think before continuing on. I walked away and went to my raking. The boys came over while I was raking and instead of going back to teaching them the unison dual bow, I worked on them doing hand touch and learning to take their turn. It was actually the opposite of trying to teach them to do things in unison. I wanted them to individually touch my hand when I asked the one to do the behavior. This exercise is a very good one to work on with your alpaca. It teaches them patience especially for those that are piggier and pushier, it teaches them their name and they do learn to take turns. Training positively doesn't mean being a pushover. Setting boundaries and expecting appropriate behavior is important. When food is involved with an alpaca, some get very excited and protective wanting it all for themselves. The result can mean spit being launched. I, personally, do not enjoy being hit by alpaca spit. It is very nasty smelling and unpleasant. I do not reward spitting behavior. I will walk away and end the clicker game if I cannot get that behavior under control. If the spit perpetrator continues after several clicker lessons, then I separate them out temporarily. I will work with them on their own away from the others but I don't want them interfering and their behavior is not conducive for any of us working well together. It can also become a negative re-inforcer. If I allow the spitting behavior to happen, the alpacas being hit with the spit, will see clicking as unpleasant because it leads to spit fights. So it is a behavior, I want to manage and control as best I can. I usually know which alpacas has the tendency to spit and I try and be prepared for their body language and noise that warns me they are ready to launch. I raise my hand and place it right in front of their nose so it is almost touching it or may even lightly touch their nose. This movement typically startles them and they normally back off and it also usually stops them from spitting. And if it doesn't, then it is my hand that gets nailed and not the rest of me. I try and feed the one that I am working with and if the pushy alpaca comes back, I repeat placing my hand right up to their nose. I then position myself so that my back is to the rude alpaca. I try and become the barrier between the alpaca I'm working with and the rude alpaca. The rude alpaca usually gets this body language and will finally stay behind me. The rude alpaca is rewarded for its behavior of staying behind me with the pellets that are dribbling to the ground from the one that I have been working with. Allowing them to pick up the remnants places their head down low and in a more submissive position and they are happy to get some treats and I am happy because they are not being rude! It may take a few sessions to get the rude alpaca to be more polite but if I am consistent in not engaging and rewarding their bad behavior, they usually start becoming more polite and standing a few feet behind me. When they are polite and I'm done training the other alpacas, I will turn, acknowledge the once rude alpaca and give it a treat from my hand, but just one bite and then walk away. Once the rude alpaca is hanging back politely regularly, I will begin clicking them and playing the hand touch game where we take turns. I will go from one alpaca to the next saying one's name and saying it is their turn and then I click that one alpaca when they touch my hand and reward them. I go to the next alpaca and say their name, do the hand touch and reward. I can have several alpacas standing around me and I will turn and face the one I am working with and say their name, it's their turn and click and feed. This teaches them their name, how to take turns, and to be patient until it is their turn. If one tries to horn in on someone else's turn, I turn my back on them. One other trick I learned for the pushier and spittier alpaca is to feed that alpaca around their chest area and I make them take a step back. I will hold the treat right at their chest so if the alpaca wants to eat from my hand, they must take a step back. This sets a boundary and provides me some personal space. It places the alpaca in a submissive position and with their head pointing downward and they rarely spit in this position. Head tilted back is their body language for spitting. Head down is submissive. So multiple important behavioral issues are being worked by doing this exercise. Does this lesson stop spitting? Not completely I must admit. But it does help get those that are frequent spit offenders to learn a different behavior that is more rewarding for all of us. To get to this point, it means that I must be consistent in not rewarding the bad behavior and maybe having to take a few spits to get them to learn what I do want. So, although some of my clicker training is for fun teaching tricks, there are some lessons that are very valuable for having socially acceptable alpacas that are more pleasant to be around especially during treat time. In my next blog, I am going to write about a new behavior I'm working on that I want the alpacas to learn that will be useful in the show ring. In my last blog, I talked about how great clicker training is because animals offer behaviors when they want something. I taught several of my alpacas the fun trick of taking a bow. It is relatively easy to teach an alpaca this trick once they learn the "touch" command. 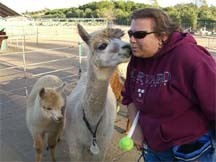 This is usually the first command and behavior I teach an alpaca when I begin clicker training them. Once an alpaca takes treats from my hand, I immediately begin teaching them "touch." I have them touch their nose to my hand and I call that "touch." The Touch Command: I begin with the alpaca eating from my open hand holding the treats and I am clicking each time they take a bite from my hand. After several times letting the alpaca eat freely from my open hand, I close my hand slightly just as they are coming to my hand to take a bite. Their momentum takes them right to my closed hand that is holding the treats and their nose touches my hand. I click as the alpaca's nose touches my hand and then I immediately open my hand for them to get their treat. I repeat this step several times. Sometimes, my closing my hand, startles the alpaca or they forget where the treat is and they back off without touching my hand. If that happens, then I go back to opening my hand for them to get a bite without my hand closing. They need a few more clicks and reminders of where the treats are. I try again after a few clicks with the open hand and see if they are ready to touch their nose to my closed hand. Once they are touching my hand more readily with the treats still in my hand, I take it another step, and have them touch my closed hand and have no treats in it. When they touch my closed hand, I click and offer treats either with my other hand or pull out a few goodies from my pouch from the hand they touched. This step teaches the alpaca patience in getting their treat. It provides a slight time lag between click and treat. This step actually starts to teach them to listen to the click and where they start realizing they are doing something to create the click. I will close my hand and move my hand to a slightly different position. I want to see if they will follow my hand even if there is no food in it. If they don't and seem confused, I go back to showing them where the treats are. I may have to go back and forth between these steps a few times. I will give the alpaca a little more time to think about things though. Being a little patient and see if they will touch my hand is when you will really start seeing them getting the idea of the click. They may be tentative at first but as soon as they hear click when they touch the hand and get a treat, within a few more clicks, they have it down. Once they start getting more proficient at the hand touch, you can use this learned behavior to now lure them to other new behaviors. Teaching the Bow: Now that the alpaca knows how to do the hand touch and you can move your hand to new locations, you can start luring the alpaca's head down towards your feet. Start in small steps again. Move your hand down to maybe your waist and click when the alpaca touches your hand. Do that step a few times and then lower your hand a bit lower, maybe to your knees. Any time the alpaca seems to get confused and not sure of what you are asking, go back a step or two and get them comfortable and proficient in earlier steps and then add more difficulty. Soon you can bend down and have them touch your hand at your feet. I like to have my hand on top of my foot because then I can transfer the hand touch to my foot. Once the alpaca is going following the hand down to the foot and getting their click and reward, I add the words, "Take a bow." I will say the words, "Take a bow" then lure them down with my hand down to my foot. I repeat that many times and maybe the entire training session requires the luring down to the foot. As they get quicker and seem to grasp the idea of going down to get their click, I will say "take a bow" and then wait a moment or two to see if they will do it on their own without a lure. If they lower their head part way without a lure, I will click. It isn't the full bow yet, but I want to click the motion of their head going down. It is one step closer to the final behavior I'm looking for and they did it on their own without a lure. If they start dipping their head down and me clicking them regularly, I will go back and lure them down all the way down to my foot. I will now tell them to "take a bow, and not click for partial bows but see if they will go all the way down. I will continue to give them more time to see if they will figure it out on their own without luring. Any time I see too much confusion, I go back to luring. I will maybe lure part of the way and see if they will continue down to my foot. But now I will only click when they go all the way down. This is step lets them think things through more and and challenges them. If they start to look frustrated or confused, help them with a lure but then ask them to do it on their own the next time. They typically get it pretty quickly if you let them figure it out. Allowing them to think it out and have them listen for the click, is where you really begin to teach them the way of the click and they begin to realize that they are doing things to earn the click. They will try different things to get that click. They may search out your hand because they know they got clicks for touching your hand. Just give them a little time to try things out. The alpaca is trying to problem solve on their own how they earned that click. But if they are totally stuck, then go back to luring. It is a little bit of going back and forth between letting them think about it and luring them to the desired position. Does this sound like it will take a long time to teach? I typically get them to learn to take a bow in one training session that lasts maybe 5 minutes! They may not be proficient but they will at least follow my hand down to my foot and more times than not, they will do it on my voice command even in that first training session! Alpacas are very smart and eager to learn. They really love the clicker game. Today, I was clicker training two of my boys to take a bow at the same time. It is tandem bowing! 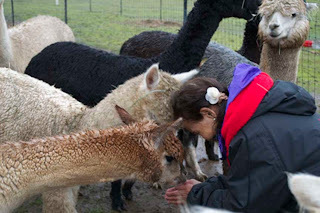 Clicker training multiple alpacas at the same time has more importance than a fun new behavior. Read about it in my next blog. Last night as I was feeding the alpacas, I went into the stall where I feed my boys carrying their bowls. I have already put their pellets in their bowls so I just have to come in and distribute their bowls. I have a latch that has to be hooked or the door will open on its own allowing boys to get out to some of my girls. Normally, I hook the latch effortlessly but last night, it was not cooperating. I had my one hand full with the bowls so I must do it single-handedly and the darn latch wouldn't go where I needed it to be. Mowgli and Olivier were standing at my elbows waiting expectantly and eagerly for their bowls. Since it was taking longer than normal, Mowgli must have assumed I wanted him to do his trick I clicker trained him to perform. He started to bow. I recently started training Olivier the same trick and he saw Mowgli bowing and he started to bow on the other side of me. Then I really had a hard time latching the hook because I was laughing so hard at my cute boys. The number one favorite reason I like clicker training is that the alpacas OFFER behaviors. If the alpacas want attention or a treat and even when we are not in training mode, they will start offering some of the behaviors they have learned. I just love the spontaneity when the alpacas start going through their repertoire of learned behaviors. I love how clicker training gets the animals to think. I taught a couple of my alpacas to kiss on cue. It is really funny when guests come to the farm and they are handing out carrots and Misty comes over for some treats and after a few bites, she starts to reach over to give the guest a peck on their cheek. The guest usually pulls back and is startled and I tell them that she is wanting to give them a kiss for the carrot. Soon, there is a lot of giggling going on as they get kisses for carrots. Teaching alpacas to take a bow or give a kiss is really easy. In my next blog, I will describe the steps to get your alpacas to take a bow or give a kiss. Next farm day, you will have alpaca ambassadors charming your guests too! When I teach my alpaca clicker training and positive reinforcement workshops, I tell students that it only takes a few minutes out of their day to train. Alpacas attention span is not very long so if you train for 5 minutes, that is pretty much a training session. We can certainly squeeze in 5 minutes to train, right? It sounds so easy to do, but the reality when you operate your own farm and business is that 5 minutes is hard to come by. Training gets slipped until maybe the next time I go out to fill up water buckets or when I bring the alpacas in for their supper and then that time comes and goes. So I totally understand when students leave my workshops and training doesn't happen, because I have the exact same issues. It is like any new habit we need to start for ourselves whether it be a new diet, or go exercise. It isn't easy to get started. Even knowing all the rewards of having well trained animals, it is not easy to find those 5 minutes. Sometimes, it is even harder to find those 5 minutes when my alpacas are as easy as they are to handle and work with. I socialize with them all the time while I am out in the pastures but it isn't formal training. So, why train more? They come running to me, they halter and walk nicely on their leads, they are engaged with farm visitors when they come so why spend 5 more minutes a day to clicker train? I have been watching more clicker training videos recently from Facebook friends and on Youtube and it is reinvigorating me to get back into training my alpacas. I have been watching Peggy Hogan clicker train her mini-horses and her techniques are so great. Watching those videos has inspired me to go back out and find those 5 minutes. Watching the videos is giving me ideas of trying new things to train. It is helping me break out of my rut. We all need that from time to time. Even the trainers need a boost and reminder. Getting back into clicker training the alpacas, I'm having fun trying to adapt some of these new techniques I've seen from these other trainers. My alpacas are having more fun and come to me every time I enter their pasture now in the hopes it will be clicker time. They are enjoying learning new things too. And, by taking that 5 minutes, I'm giving myself time to enjoy my animals. Running a farm is hard work. There is never enough hours in the day to get everything done. But by giving myself those 5 minutes with my alpacas, I'm reminding myself, why it is that I'm working hard. After all, the reason I wanted my own farm was to be able to enjoy my animals each and every day. Clicker training isn't just about teaching the animals new behaviors. There is an added benefit to clicker training. It has provided a good and positive reminder to stop and just enjoy my alpacas. And, by doing so, I am more energized and excited about training and being in this alpaca business. That is a pretty good return of my time investment of only 5 minutes. I'm glad I dusted off the clicker. I get one question that I can almost guarantee I will get asked at one point during one of my alpaca training workshops or when someone asks me how clicker training works. I get asked if clicker training will work on their husbands, kids or employees. I smile as if I never have heard that question before and say of course it works. After all, clicker training is based on positive reinforcement techniques. The click just marks the behavior that we are striving for and then when the alpaca hears the click, they know that they are going to get a treat. They would like another treat or goodie so they work on figuring out what it was that they did that made that click that then led to the treat. Once the alpaca has figured out what they did to create the click, you can see their eyes light up and the repeat of the behavior happens more quickly. So how would this work in humans? Some coaches have discovered how clicker training can be very effective in training young athletes the correct techniques for their sport. An organization called TAGTEACH uses the clicker and has developed a methodology that is utilizes positive reinforcement in training mostly kids in sports as well as for school subjects. It is a fantastic method that has shown real potential in working with autistic children, ADD children as well as many other issues. I took a TAGTEACH workshop many years ago and came away wondering why more coaches and schools don't implement such a great method for educating and training our youth. TAGTEACH uses a method that breaks down the series of tasks needed to be learned into a single task that can be focused on. For example, if you were trying to teach someone to tie their shoe lace, it would be rather complicated to just explain the entire process. If you were going to clicker train someone to tie their shoe lace, you would break each step down from one taking one lace under the other. That piece would get practiced and clicked each time the student did that much correctly. Then the next step would be to take the other lace and loop it and you'd click that. After each step was shown and clicked, you could try putting two or three steps together as one task and click if they get all those steps done correctly before receiving a click. If you see they are still struggling over a step, you go back and break down those steps. There is no shame or blame if it isn't done correctly. It is more on the coach or teacher to figure out how small a step is required to get the student proficient. If you see one step not being done correctly, then the teacher knows that step needs to become a task to be focused on with the click. In another example, if a gymnast is having a hard time understanding the coach in how to place their arms over their head at the completion of a routine then the coach will tell the youth to listen for the click and the coach will click when the arms are in the correct position. If the gymnast doesn't hear the click, they know their arms aren't in the correct position yet and work to get them where the coach wants them. When they hear the click, they get it. A few repeats and the muscles and body now understand where to go. It removes the communication issues. The gymnast gets frustrated because they think they have their arms in the correct position and the coach gets irritated because they have to keep repeating the same correction with no success. Enter the clicker and within a few clicks, the gymnast has the correct form. I watched videos and saw how quickly students and athletes learned techniques. How could something like this be implemented in the workplace? When I worked as an engineering supervisor, we were tasked to improve the low morale in our employees. The only recommendation most supervisors could come up with was monetary rewards but there was very limited funds for financial rewards and they usually take so long to get approved. For positive reinforcement to be as effective as possible, it should occur as close to the behavior that we want as possible. That is why timing our click is so important. I suggested something very simple. How about we just acknowledge and thank an employee when they have done something really well. A personal note or going up to an employee to thank them is always appreciated. I know I like it when my hard work is appreciated. I was shocked when another supervisor's response was so negative to that idea. He stated that the employee's paycheck was all the thanks they were going to get from him. However, I noticed how quick this supervisor was to find fault and let an employee know when they made a mistake. At first I thought he was joking but as we discussed the topic, he was so against being positive. I thought that to be very sad indeed and was very glad I wasn't one of his staff! Did I use a click as a supervisor? No, but I used the same philosophy. I rewarded the behavior I wanted to get. And because I did that, I got offered more desirable behavior without asking and having to micro-manage to get it. By shifting my attitude to be more about positive reinforcement, I found myself looking for what was right and not what was wrong. Sure, there were still mistakes but because I had shown so much appreciation for what was done correctly, employees were more likely to take responsibility to correct the mistake or admit the mistake before I discovered it. And, I found employees wanting to get the reward by showing me what they were doing. I knew more what was going on in my group because my staff was now eager to share what they were doing with me. They weren't afraid of having their effort being discounted or find fault with. They knew it would be appreciated for the hard work they put into it. Who doesn't want to be appreciated for their work? I look forward to being asked this most often question of "Does Clicker Training work with...?" I get to get on my soapbox and make it a teachable moment and share how amazing positive reinforcement works. Read more about my clicker training experiences in my upcoming book, Alpacas Don't Do That due out this summer! Calzada's Manchu's Olivier Takes 1st Place at AOBA Nationals! It was a fun alpaca show season for Alpacas at Hum Sweet Hum. We attended 3 AOBA shows this season. Alpacapalooza in Washington was the first. I took 5 alpacas; Calzada's Manchu's Olivier, HSH Calvin, HSH Jujube, HSH Speirit Light, and Peruvian Qinti's Charango (co-owned with Aragon Alpacas). We came home with ribbons from the entire herd. I was walking on cloud-9 after winning Reserve Color Championship with Olivier. The judge was very impressed with my boy. 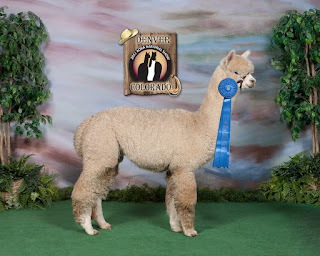 During the final championship round, the judge examined Olivier and the alpaca that won Color Championship multiple times. She was having such a hard time deciding who would take first. The excitement mounted each time the judge would take a step back and ponder her decision. We were standing next to one of the bigger named farms who have consistent champions, so taking Reserve behind that farm and knowing how close we were to taking Color Championship was a real thrill. Charango also took a 1st place and had such great comments regarding his fleece mentioned by the judge. Jujube took a 2nd place too. Speirit Light and Calvin were in such competitive classes for their colors. Speirit light took 5th place and she was standing next to so many big farms so coming home with a ribbon was huge for us. I have to say, the alpaca breeders are doing such an amazing job breeding fantastic fleeces. The competition is so stiff. There is so little differences between first and 6th places that the judges have a difficult time finding the qualities to decide on placements. 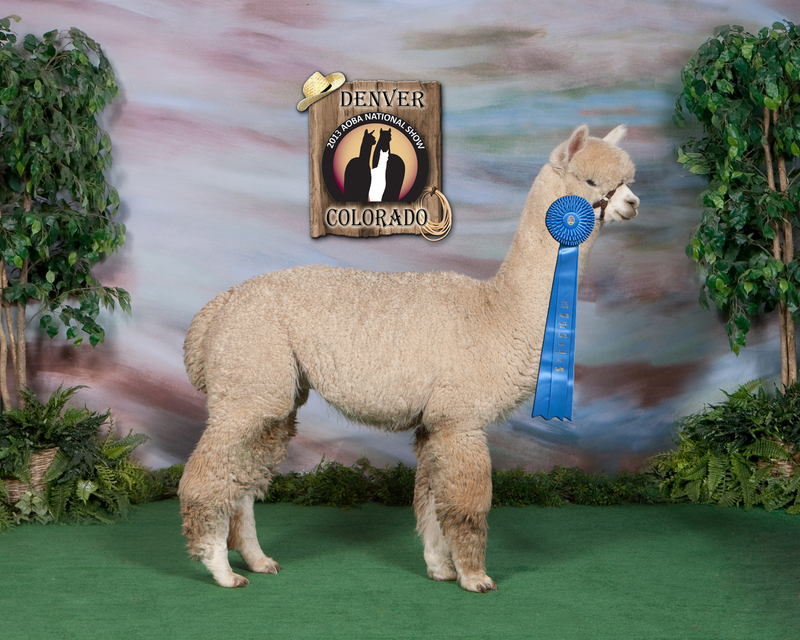 HSH Jujube takes 2nd place at AlpacaPalooza. The second show we attended was CABA in Portland, Oregon. Again, the competition is so amazingly tough. We had a great time and Calvin and Olivier came home with 2nd places and Charango came home with a 3rd place. But the most exciting show for us was Nationals. I sent Olivier to see how he would do against that level of competition. I was unable to attend myself, but sent him with another farm, Wings and A Prayer Alpacas. I sat on pins and needles when I received the text that Olivier was in the ring. I had to read my text twice when I saw that he took 1st place! My boy Olivier brought it home! The judge just loved his strong conformation and consistent, fine and dense fleece. The show kids are all home again and we are all happy to have them home. Now, we are anxiously awaiting our first cria from Olivier to see how well he passes on his amazing qualities. There are two babies due this fall and we have dates lining up for him after his exceptional wins this spring. It is a long road to get these alpacas to shows. Breeders spend many hours researching genetics and the Alpaca Registry to choose what male or female they want to breed to. Then, we have to wait about 11 1/2 months for the baby to be born and at least 6 months before they are old enough to send to alpaca shows. This spring was Alpacas at Hum Sweet Hum's best show season to date. Now, the fun begins again with new babies and then their show time!